Cheryl Archibald worked her way around the parking lot, stopping to chat with visitors at the Ville Block Party. The annual event draws upward of 500 people in the Ville neighborhood of north St. Louis to St. Matthew the Apostle Parish and provides backpacks, school supplies, uniforms and other resources as children head back to school. It’s organized by the Ville Collaborative, one of several community initiatives that have grown out of St. Matthew Parish. Holding up a pair of child-sized khaki pants from the table of uniforms, Archibald said, “I don’t think these are going to fit me,” as she joked with 3-year-old Levi Lawson and his mom, Miesha. In July, Archibald was appointed by Archbishop Robert J. Carlson as St. Matthew’s parish life coordinator (PLC), which “has the responsibility of administering and overseeing the temporalities of a designated parish, as well as participating in and giving pastoral direction to the parish,” according to the archdiocese’s definition. The role is more than a business manager; a PLC is entrusted to caring for the pastoral needs of a parish community, too. 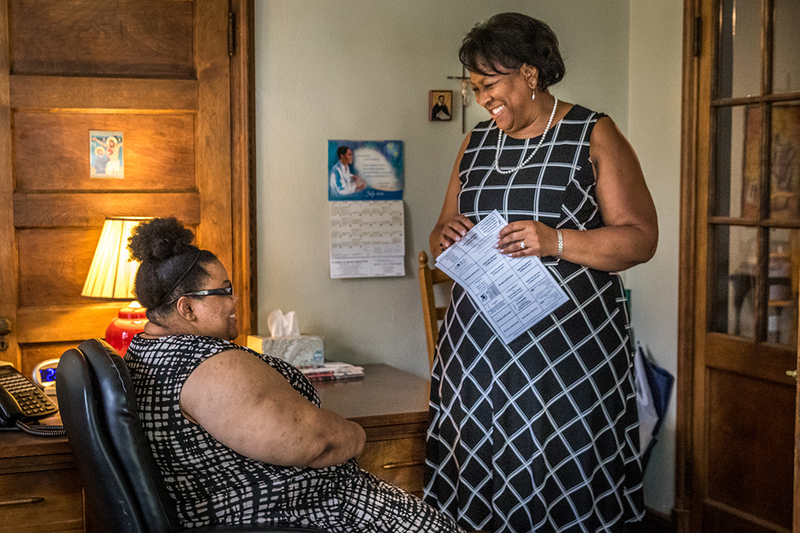 Archibald talked with her daughter, Chazara Archibald, who also volunteers at the church. It’s a new model of parish leadership being implemented in some parishes in the archdiocese, especially as the number of priests in the archdiocese declines. The new role underscores the importance of a planning-and-viability study conducted in parishes in 2015, with the parish life coordinator as one of several viable options for parish governance. St. Matthew has been a longtime anchor in the Ville neighborhood. Founded 125 years ago, the parish came under the Jesuits’ leadership in 1959. St. Matthew pastor, Father Patrick Quinn, recently accepted a new role at Regis University in Denver. The reassignment gave the Jesuits an opportunity to look at a model of lay leadership, which the community has implemented in other parishes, including in Kansas City. “The Jesuits have been involved in this model of ministry for years,” said Jesuit Father Mark McKenzie, former St. Matthew pastor and pastoral assistant for the Jesuit Provincial. “Within the Jesuits, we use the term ‘director of the works.’ At St. Matt’s, in our minds, Cheryl is the director of the works. We want to move in this direction and follow the trail of the gifts God has given,” Father McKenzie said. Jesuit Father Kevin Cullen resides at St. Matthew and is assigned as the canonical pastor, but in practice, he serves the sacramental needs of the parish, including celebrating Masses. At a Mass in July commissioning Archibald in her new position, Father Cullen described the transition as a moment to give thanks to God for the abundant gifts of the parish, likening it to the Gospel reading of the loaves and fishes. As parish life coordinator, Archibald will blend the experience of a pastoral associate and business administrator, overseeing all of the functions of a parish that a priest pastor typically would do, minus the sacramental and liturgical needs that only clergy provide. She has a master’s degree in pastoral studies from Aquinas Institute of Theology, previous experience handling parish finances and work experience as a program manager with the National Geospatial-Intelligence Agency, plus she is a former chair of the board of directors with Catholic Charities of St. Louis. 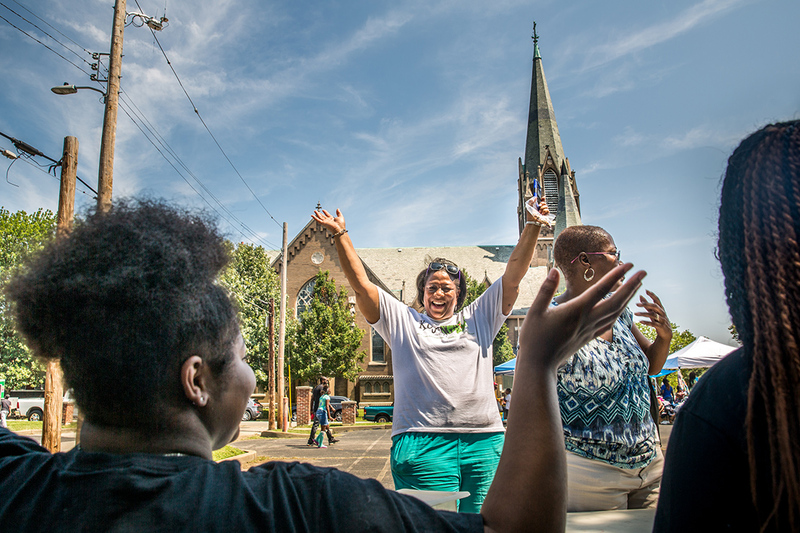 Cheryl Archibald greeted Janyah Mitchell at the Ville Block Party sponsored by the Ville Collaborative in August at St. Matthew Church. The fair included back-to-school supplies for students, service information, food and music. It takes a well-rounded approach. Archibald leads RCIA classes, organizes volunteers to help with children’s Liturgy of the Word, prepares parents for infant baptism, organizes a weekly Bible study, visits with sick and homebound parishioners regularly and participates in parish, community and deanery meetings. “What I don’t do personally, I get parishioners to do,” she said. St. Matthew has about 100 registered households, with parishioners coming from more than 30 zip codes across the archdiocese. Some are legacy families who have been at St. Matthew for several generations. 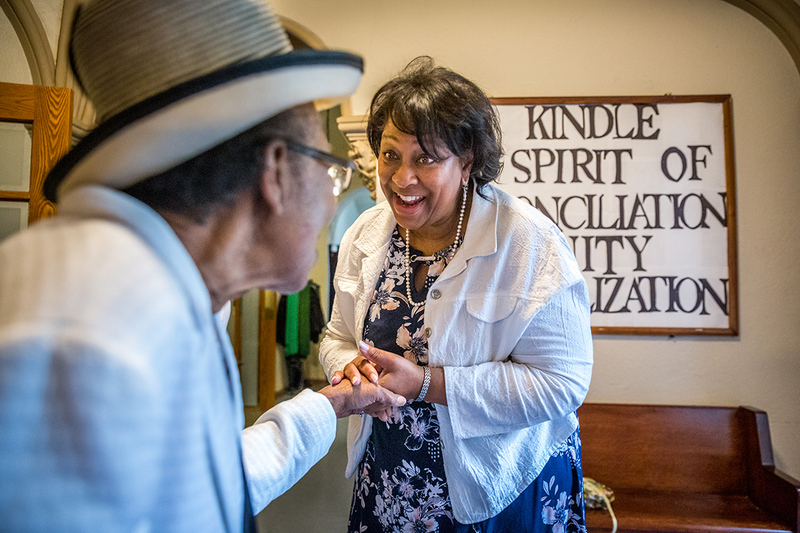 The decision of the archdiocese and the Jesuits to move the parish forward with a new leadership model, she said, says a lot about the commitment of St. Matthew to the Ville neighborhood. Several community organizations have roots in the parish, including Northside Community Housing and Northside Youth and Senior Services. Other efforts have parishioner involvement, including the Ville Collaborative, Revitalization 2000, Project Read and Feed and the Society of St. Vincent de Paul. Those entities underscore the long-term impact the parish has on the community. Archibald talked with long-time parishioner Annie Cunningham after Mass in July. Archibald looks forward to continuing the parish’s mission of serving the spiritual needs of parishioners and the physical needs of the community under this new model of leadership. What is a Parish Life Coordinator? A parish life coordinator has the responsibility of administering and overseeing the temporalities of a designated parish, as well as participating in and giving pastoral direction to the parish. The role incorporates a team approach, with a canonical pastor providing for the sacramental needs of the parish. Deacon Allen Boedeker became the first parish life coordinator when he was appointed in 2011 at St. Andrew Parish in Lemay. Several other parishes have a parish life coordinator, including St. Robert Bellarmine in St. Charles, Immaculate Conception in Maplewood, St. Rita in Vinita Park and St. Francis of Assisi in Portage des Sioux and Immaculate Conception in West Alton, led by permanent deacons, and Most Holy Trinity in north St. Louis, led by a woman religious. Another model is parish administrator, who manages business operations of the parish under the leadership of a pastor. And a model prominent in rural areas of the archdiocese includes a parish pastor who also administers smaller neighboring churches, sometimes called mission churches. St. John Nepomuk Chapel in south St. Louis has a permanent deacon director. A parish life coordinator helps fulfill a role of coordinating a parish’s prayer and service, which is typically coordinated by a priest. In the Archdiocese of St. Louis, the role is seen as a stop-gap measure to meet the needs of a parish as the archdiocese continues to increase vocations to the priesthood. Father Aaron Nord, a canon lawyer with the Metropolitan Tribunal of the Archdiocese of St. Louis, noted that each parish life coordinator serves under a “canonical pastor,” a layman’s term for a priest who has the authority of a pastor in a parish where the parish life coordinator serves.